Before I review this, I’ll point out that I never read the previous two volumes in the series, so I cannot compare how this one stacks up to the other ones. Having said that, this collection of essays from some of the more important names in the RPG industry is quite the entertaining read, even if being a game designer isn’t your dream job. The book consists of twelve essays by Wolfgang Baur, Monte Cook, Rob Heinsoo, Colin McComb, and Ed Greenwood, creator of the Forgotten Realms. As you can probably gather from the name, the essays are all about design. Whether it’s plot or mechanics, the book tackles it all. Now, being a 4e DM, my favorite article was written by Rob Heinsoo. 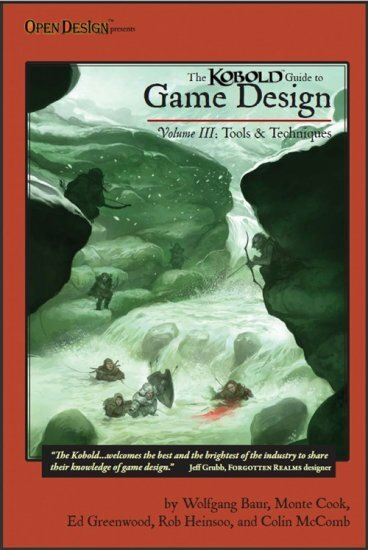 Rob was the lead designer of 4e D&D, and he shares many anecdotes and “behind the courtain” nuggets in his essay titled “Seize the Hook”. Even if design isn’t your thing (it isn’t mine btw), this book is not a hard read. If you love design, well then, what can I say. This is right up your alley. I must admit, there’s a chapter on designing a quick and dirty combat system that I enjoyed reading. So in closing, I recommend the book. The essays are fast reads that will give you some insight into what goes behind the game you’re playing. It’s never preachy or condescending, and doesn’t assume you already are a designer of sorts. Although to an extent, what DM isn’t some sort of designer? The lowest price on Ebay for the ‘Desert of Desolation’ Warhorse mini, at the time of this writing was around $9.00 with shipping. That’s a fairly steep price to pay for a horse miniature for D&D. Stuffer Shack sells an equally useful set of horse minis at 5 for $14.00, or about $2.80 a horse. 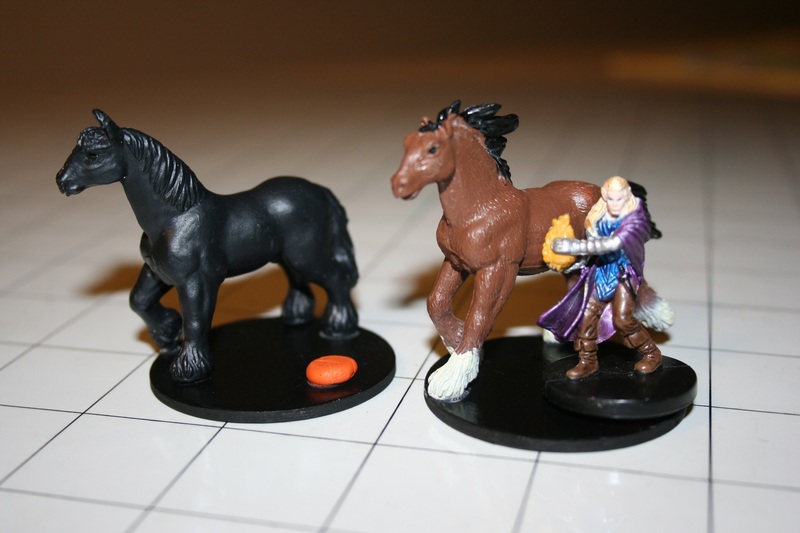 Now, these horse are not as nicely sculpted as the official mini, and the glue holding one of them to the base came loose in my set, but they are good enough for your game if you find the WOTC one too pricey in the secondhand market and really want horse minis. The base comes with a bit of putty, so that you can attach a mini of the character who is “riding” the horse. The horses are glued to the plastic bases, they are not permanently attached. Stuffer Shack sells a couple of other things, and what they sent me for review is a combination of all of them, called “Adventurer’s Bundle” and it retails for $24.97. 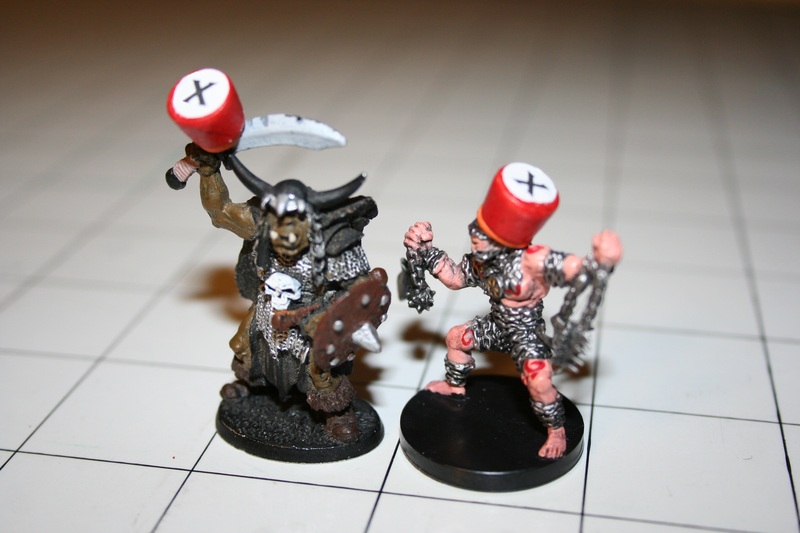 It consists of the aforementioned horse miniatures, 5 bloodied markers (consisting of a red plastic with an “x” label attached to it and some putty to place it on the bloodied mini), and 10 mini counters (a black plastic with a numbered label and some putty to attach it to the mini). All these items are available separately, but you save a little bit if you bundle them up. I personally believe that while the idea behind the product is solid, the price may be a little high for what you are getting. Having said that, the convenience of numbering and marking minis, along with clearly defining who is bloody may outweigh that at your table. For what it’s worth, I found them useful the other day in my SWSE game. Stuffer Shacks store is located here. This product is really, really neat. It generates all sorts of treasure in 4e style parcels. The only thing it does not do is add weapons or armor to the mix. Broken down by type, I got descriptions of jewelry, art, potions, gems, food and drink, and coins. 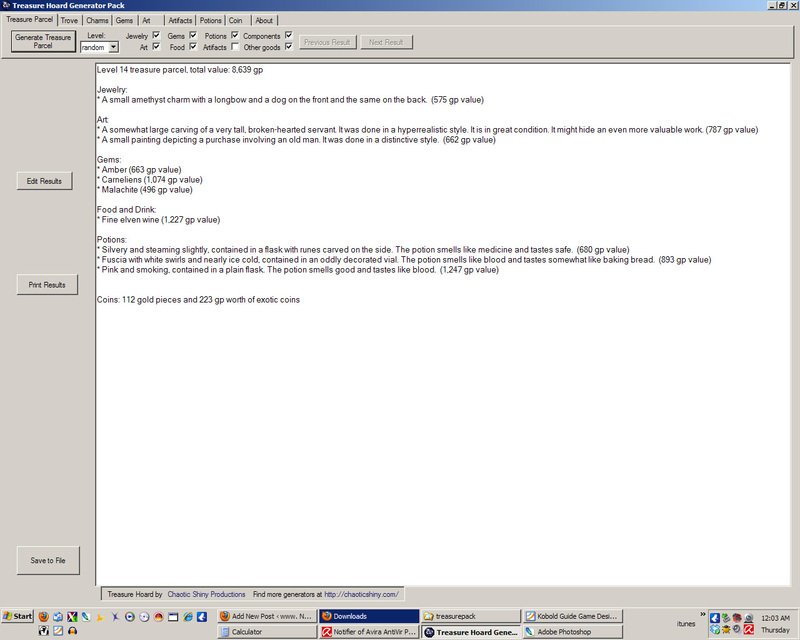 It’s defined as a Level 14 treasure parcel, total value: 8,639 gp. Granted, in the DMG this isn’t a treasure parcel amount, but it falls withing the guidelines and it’s not game breaking. If there’s something you don’t like, you can always edit it before printing it out. 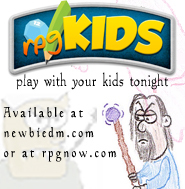 This does not include any magic items from the PHB, it is strictly for other types of loot. It is very useful however, to turn a boring “780gp painting” into something a little more colorful. I created a very cheesy coin with my avatar. The point is you can use your art to make coins for your world, and print them out and have for handouts, etc… neat stuff. For $3.95, the price isn’t bad, in fact it is very generous, and the product works rather nicely. I recommend it. Glad you like the treasure pack! My if I link the review on my Reviews page? The “Artifacts” check box adds just that to the treasure parcels. I can’t use the stuff from the PHB because the GSL is very specific about no one ever making any software that uses anything from 4e ever. That’s also why the treasure parcel amounts aren’t exact – that stuff isn’t in the GSL, either. 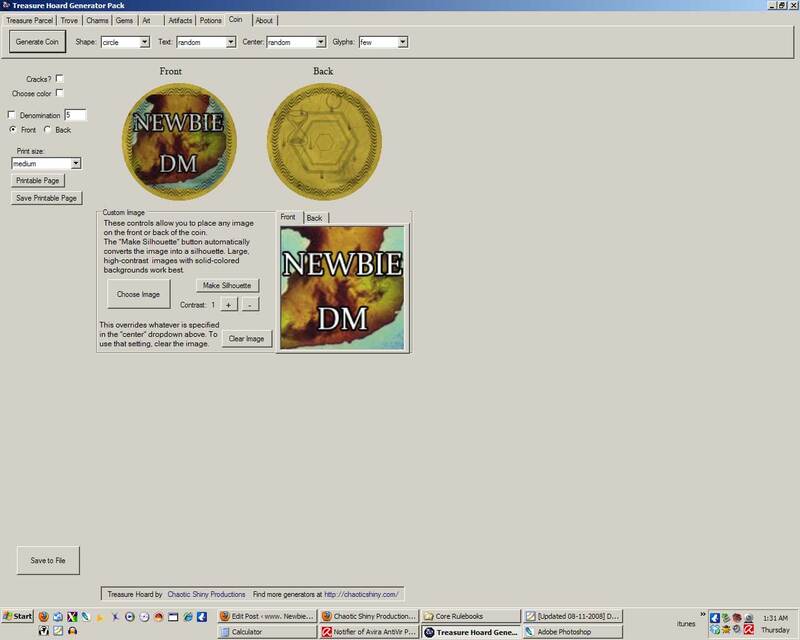 It’s technically a “4e style treasure parcel” gen. I know you’re not the only one disappointed by that, but unfortunately there’s nothing I can do. In the photo of the horse minis, are they both Stuffer Shack horses or is one of them the WotC one. They look quite different. Stuffer Shack sells an equally useful set of horse minis at 5 for $14.00, or about $2.80 a horse. What’s the color mix on those horses? Do you get a white one? Oh, I see by clicking on the link you get one matched pair and three others, but if you buy the hero’s bundle you do get a white one and a gray Shadowfax one too. Thanks for the review, it’s much appreciated. As for the glue coming undone on one of the horses, sorry about that. I just switched to a new glue – perhaps I’ll go back. I’ll have a replacement horse in the mail by tomorrow. Thanks again! I get the horses in packs of 10-12, and then mix them up (there’s a variety of them). They are not from WotC. When I put the packs together, I just mix the horses up. If there’s anything you want in particular, just let me know. I’m happy to oblige. I’m positive those horse minis come from a Michael’s (the craft store) tube of plastic horses, but with bases glued on. I’ve bought a tube from Micaheel’s myself and made my own horses (most of them are perfect scale) but it’s nice that there’s an option for people who don’t have a similar store near them. You’re exactly right. My wife is a Michael’s freak. I thought about ordering them directly from the company that makes them, but it’s more expensive that way. Tourq gave me some mini counters and horse minis for free and my group loves them. We use the mini counters all the time!